Announcer calls Asian pitchers "Oriental." Two nights in a row. Hawk Harrelson didn't get the memo. Or perhaps threw it in the trash. Hawk Harrelson is on a roll. Oh, what has he done now? 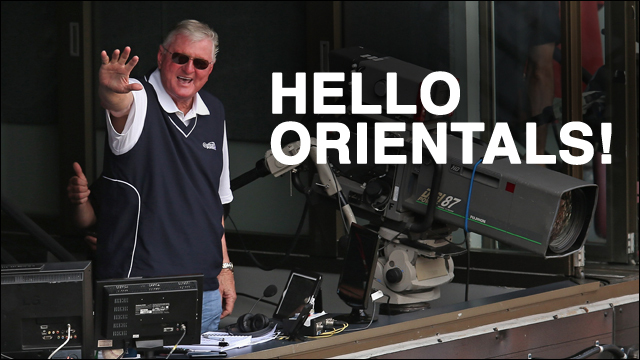 This week, the longtime announcer for the Chicago White Sox used the term "Oriental" to describe an Asian pitcher on two occasions, two nights in a row. Classy. During the broadcast of Wednesday night's game against Boston, Harrelson referred to Red Sox pitcher Junichi Tazawa as "oriental." On Thursday night, he did it again. I guess Hawk didn't get the memo, or perhaps just crumpled it up and threw it in the trash can. Many, many decades ago. You might recall a moment earlier in the season, when Harrelson provided some colorful commentary about Cleveland pitcher Chen-Chang Lee, describing one of his pitches as "typical Asian motion. Deception involved." Big deal, you say. You can argue he's an old timer, a broadcaster from another era who can't be bothered to keep up with what everyone is calling themselves these days. But Ken "Hawk" Harrelson isn't just the elderly man you encounter at the gas station, or your cranky uncle at the dinner table -- the people you tend to roll your eyes at and try to ignore. He's a broadcaster for Comcast Sportsnet Chicago who is paid to talk and/or, at the very least, not say idiotic things.